Updside: Very well located. Subway line 7 40th-Lowery, 20 min to Time Square. Safe neighbourhood, with McDonald's right next door. Room was clean and did not have any funky odor which was good. Bed was confortable. On downside: Windows had a gap between them (had to put a towell to limit air and street noise) and one was cracked. The curtains did not close properly. Breakfast area was messy and they ran out of donuts daily. Only had one toaster that took forever to work. Staff were very helpful and courteous. Check in was quick and seamless. 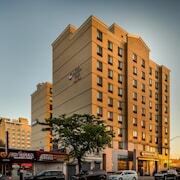 Where to find Long Island City hotels near an airport? 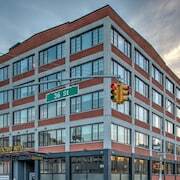 How can I find hotels in different Long Island City neighborhoods? 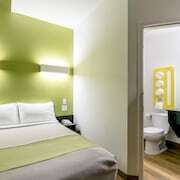 Where can I find hotels in Long Island City that are near tourist attractions? There’s more to New York City than Manhattan alone. In-the-know travelers frequently head to the outer boroughs for a more authentic — and less expensive — experience, and no place offers regional delights quite like Long Island City. Situated in the heart of Queens, this area is home to multicultural restaurants, interesting architecture, and a surprisingly cutting-edge art scene. Plus, the rates at Long Island City hotels are generally cheaper than anything you’ll find in Manhattan, so you can take a bite out of the Big Apple without chewing up your savings account. Need a little help choosing the best options? 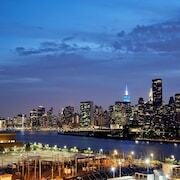 Let Expedia.ca give you the inside scoop on the top places to stay and things to do in Long Island City. Long Island City vacations are perfect for sightseers and art lovers alike, so make sure you book the reservations best suited to your personal style. 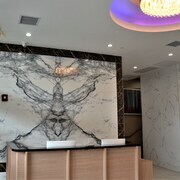 If you have an eye for street art, check out the Long Island City hotel deals near 5 Pointz. This converted warehouse is something of a showroom for graffiti artists, and some of the city’s most vibrant pieces are splayed across its walls. The Fisher Landau Center for Art is another must-see spot, but don’t miss MoMa’s PS1 on Jackson Avenue. This innovative museum is among the city’s most forward thinking. Of course, when it comes to the best hotel in Long Island City for your budget, don’t be afraid to look beyond the sightseeing path. Plenty of trains service the area, so you’ll never be far from the main attractions. Who knows? You might even find a discount on the spot of your dreams. Ready to start planning? Use the travel tools at Expedia.ca to search for flights and car rentals in Long Island City. Then, once you’ve taken care of the transportation essentials, make a reservation at the ideal Long Island City hotel for your family, and prepare yourself for a peek at the city that never sleeps. What are the most popular Long Island City hotels? Are there hotels in other cities near Long Island City? 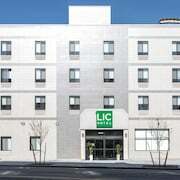 What other types of accommodations are available in Long Island City? Explore Long Island City with Expedia.ca’s Travel Guides to find the best flights, cars, holiday packages and more!